2Department of Surgery and Radiology, Faculty of Veterinary Medicine, University of Tehran, Tehran, Iran. Objectives- The purpose of the study was to observe whether PRP, Mesenchymal Stem Cells (MSCs) and combining them could help make improvements the healing of Achilles tendons in rabbits. Animals-Sixteen male, healthy and mature white New Zealand rabbits. Procedures- The animals were randomiaed into 4 groups: Control, PRP, MSCs with fibrin glue and MSCs + PRP therapy. A 3 mm diameter defect was created in the midsubstance of the medial M. gastrocnemius tendon in all rabbits. After 4 and 8 weeks, animals were euthanized (each time point, 2 rabbits of the each group) and samples were examined in term of histologic scoring with H & E and Masson's Trichrome. Results- Histologic investigations confirmed that all 3 methods of treatment in Achilles tendon defect had suitable reparative effects. Final histologic scoring for control group at 4th week after operation was 4.5 in contrast to treatment groups (PRP =6, MSCs = 5.5 and MSCs + PRP= 8). Final histologic scoring in all 4 groups improved at 8th week after operation (control=6.5, PRP =9.5, MSCs = 8.5 and MSCs + PRP= 14.5). Conclusion and Clinical Relevance- This study indicated that using PRP or MSCs treatment alone and combination of them in injured tendon improved healing process and decreased time of repair. Reparative effect of PRP in tendon defect was better than use of allogenic MSCs treatment. However, the combination of them caused the best results. The tendon, which is the strongest in the human's body and is called the Achilles tendon, is around 8.2 times body weight when running tolerated. It transmits forces from the M. gastrocnemius and M. soleus complex to the Calcaneus and therefore, allows movement.1 About 30 to 50 percent of sports injuries constitute tendon injuries.2 Compared to other soft-tissues, the tendon has weaker vascular system and therefore heals gradually. (a) tissue inflammation, (b) cell and matrix proliferation, and (c) remodeling and maturation. The inflammatory stage usually includes a hematoma formation, thereby triggering the discharge of chemotactic factors such as IGF-1(Insulin-like growth factor 1), TGF-β (Transforming growth factor beta), platelet-derived growth factor (PDGF), and also basic fibroblast growth factor (bFGF). Cells which have inflammation in them are drawn from the tissues around there to absorb the clot, remaining cellular particles, and the materials coming from outside. Fibroblasts are taken to the location to start synthesis of elements of the extracellular matrix. Also, angiogenic factors discharged in this stage trigger the development of a vascular network. As fibroblasts are necessary for synthetizing proteoglycans, collagens, and some other extracellular matrix elements, proliferation of these cells goes on through the stage of cell development. At this stage in the process of repair, the extracellular matrix is mostly made up of type III collagen. When the proliferative stage has ended, the repaired tissue is remarkably cellular and consists of almost big portions of water and a great deal of extracellular matrix elements. The remodeling stage will start 6 to 8 weeks following injury which is recognized by a drop in cellularity, lowered matrix synthesis, a drop in type III collagen, and a rise in synthesis of type I collagen. The fibers of type I collagen are arranged in a longitudinal way standing alongside the tendon axis which are necessary for the mechanical power of the tissue regeneration. In spite of numerous continuous stages of remodeling, the repaired tissue will hardly ever obtains the features of normal tendon.7 In latest years, many different therapies for tendon injuries have been utilized or tested including bone marrow-derived mesenchymal stem cells (MSCs) and platelet-rich plasma (PRP) which has revealed remarkable results in modulation of Achilles tendon repair.8,9 The majority of studies have confirmed that platelet-rich plasma (PRP) is useful in lowering inflammatory processes which happen after injury and speeding up soft tissue recovery. Studies previously conducted demonstrated that PRP assist to generate blood vessels and improve collagen fiber depositing in the injury location.10,11.On the other side, PRP, which is an autologous concentrate taken from blood platelets, has been presented as a completely new treatment for tendon injury. Through providing growth factors in the location of lesion, Platelets play a vital role in the cascade of tissue recovery.12 when platelets are activated, they discharge growth factors, including insulin-like growth factor -1(IGF)-1 vascular endothelial growth factor (VEGF), and platelet-derived growth factor (PDGF) coming from their granules.13According to the research results, PRP therapy in tendon injuries leads to much better histological qualities of the tissue repaired.14 Yet, a number of studies confirmed the beneficial impact of PRP or MSCs on regenerating tendon, but utilizing the combination of these treatments have not been studied before. The purpose of present study was to examine the impacts of using bone marrow-derived mesenchymal stem cells and PRP, when used alone and in combination, on recovery processes after partial tenotomy. The final results of this study can be useful in clinical setting. Sixteen healthy and mature male white New Zealand rabbits (weight: 2-2.4 kg and around 11 weeks of age) bought from the Razi Institute of Iran were used in this study. The animals were held in standard cages under steady temperature of 18-22 °C, and humidity level of 40-50%, with12 h/12 h light and dark cycles, with easy access to standard food ( the ration set for rodents) as well as filtered water from tab. 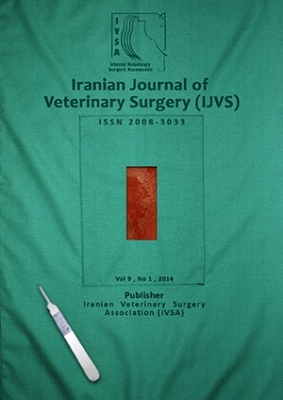 This study was done according to guidelines of animal care review board of the University of Tehran and the law of ethics comity in Faculty of Veterinary Medicine. Control: animals with partial Achilles tendon defectand no treatment. PRP: animals with partial Achilles tendon defectand PRP treatment. MSCs: animals with partial Achilles tendon defectand MSCs treatment with fibrin glue. MSCs +PRP: animals with partial Achilles tendon defect and combined treatment ofMSCs and PRP. The animals were anesthetized by intramuscular injection of ketamine hydrochloride 10% (35mg/kg ,Alfasan, Woerden-Holland) and xylazine hydrochloride 2% (8 mg/kg, Alfasan, Woerden-Holland). Anesthesia were continued in the rabbits with the application of inhalation machine and isoflurane 1% with tracheal tube size of 2 mm. The surgery of Achilles tendon in these rabbits were performed at Department of Small Animal Surgery of Faculty of Veterinary of Medicine, University of Tehran. Following anesthesia, the rabbits were put on a table, in ventral recumbency posture. Also their rear and fore limbs were gently immobilized by some thin ropes. The right hind paw was shaved and ready for sterile operative intervention. For this purpose, the skin was opened with a 2-cm longitudinal incision and a lateral Paramedian approach after a longitudinal splitting of the crural fascia and the Paratenon surrounding the Achilles tendon complex. Through this method, the Achilles tendon was accessible for subsequent procedures inducing defect or performing treatment. The medial M. gastrocnemius tendon was separated from surrounding tendons such as the lateral M. gastrocnemius tendon and the M. flexor digitalis superficialis tendon. Achilles tendon defect was induced with a 3 mm diameter round-shaped defect in the midsubstance of the medial M. gastrocnemius tendon utilizing a biopsy punch (Fig 1). The defect made in the control group remained untreated, but PRP treatment and MSCs prescription were used in PRP group and MSCs group, respectively finally, the combination ofMSCs and PRP treatment was used in the last group ( MSCs+PRP group). The tendon was situated in the normal site and the related fascia/Paratenon closed applying continuous suture and vicryl twine. The muscles and derma of skin were closed by 5.0 vicryl twine for the muscles and 5.0 prolene twine (Ethicon) for the skin. For reducing pain in these animals analgesic drug (Tramadol, 4 mg/kg IM, Chemi Daro-Iran) and for prevention of infection antibiotics (enrofloxacin, 10 mg/kg SC, Aburaihan-Iran) were prescribed. After 4 and 8 weeks for each group, all the rabbits were euthanized (thiopental sodium 100mg/kg IV) and then tissue specimens were extracted and submitted to laboratory. Tissue samples in each group were used for histopathological evaluation. After inducing anesthesia, 10-mL of autologous blood was taken from the heart of each rabbit to prepare PRP. In this study, we used My Cells® harvesting kit. Blood was drawn and mixed gently with anticoagulant citrate dextrose solution (ACD). It was Centrifuged 10 min, 1450-2050 G, room temperature. Then PPP phase was removed carefully and plasma was drawn from the surface. Remaining PRP was drawn into syringe without touching the separation gel. Then Calcium gluconate (10%) activator was included in a ratio of 1:10 to get the total volume of PRP (as the instructions on the kit). In PRP treatment, regardless of its preparation method, the number of platelets must be 3-5 times more than the peripheral blood. In this study we used PLT count to understand if the number of platelets was in the mentioned range. It was about 1200000 per µl. In this study, the cells used were allogenic (from two rabbits out of the study) mesenchymal stem cells (MSCs). Also, Bone marrow was aspirated from the iliac crest through a sterile surgical procedure. An incision was created over the iliac crest, periosteum was ruined, and a tiny hole was drilled via the cortex. Five milliliters of bone marrow were aspirated from each rabbit into a syringe which was covered with 3,500 IU of sodium heparin. Cells were then cultured in Dulbecco’s modified Eagle’s medium-high glucose, including 1% antibiotics and 20% fetal bovine serum, which, based on the method proposed by Lennon et al. 5,was particularly screened to increase proliferation of mesenchymal stem cells in rabbits with no differentiation. The cell culture medium were changed every 3 or 4 days, and were preserved for 10-14 days. Intact colonies were acquired from the flask with 3ml of 0.25% trypsin-EDTA. The cells were then gathered, washed, centrifuged with DMEM, counted, and replated to the first-passage. These colonies were used in the final-passage until cell count of mesenchymal stem cells reached to 2.5 × 106 cells per 75 cm2 flask. The flow cytometery as a supplementary and safe method was performed for the confirmation and identification of the cell surface indicators of Mesenchymal stem cells of the rabbit’s bone marrow. After performing this method, the samples were poured into the flow cytometer pipes and then it was read by FACS Canto II (BD Bioscience, USA) flow cytometer set analyzed by Flowjo software and displayed in histogram form. The flow cytometer results of Mesenchymal stem cells showed that these cells stated the cell surface indexes of CD29 (92%), CD90 (89%). Meanwhile, CD45 (the indicator of Hematopoietic cells) and CD34 (the indictor of endothelial cells) were negative. All rabbits were euthanized at 4th and 8th week after operation (each time point, 2 rabbits of the each group) and the Achilles tendon of right leg was transected below its musculotendinous junction and over the calcaneal attachment of it. From each group, a harvested tendon was extracted and washed in physiological solution. They were then put in 10% buffered formalin and inserted in paraffin in order to submit them for histopathological analysis. Some thin sections (5 μm) were cut and stained with hematoxylin-eosin (H&E) and Masson's trichrome (MT) as a particular connective staining tissue used for histopathological evaluation. 10 fields were chosen randomly from each section under light microscopy. All the tendons used in this study were blindly evaluated by two investigators. Macroscopic criteria for evaluation of these tendons were occurrence of adhesion and inflammation. Histologic scoring system for quantitative evaluation of these tendons is based on the result of the study by Stoll et al.3 with some minor modifications presented in Table 1. These criteria for scoring of these tendons included Extracellular matrix (ECM) organization of all the tendon, Cellularity/cell-matrix-ratio, cell alignment, Cell distribution, Cell nucleus morphology ,organization of the tendon callus, vascularization and inflammation. Table 1. Histological scoring system (Adopted from Stoll et al. 3). After the operation, the rabbits had quite freely movement in their cages without any restriction of movement and behavior change. Rabbits had been tolerated well the surgical procedure, MSCs treatment, the PRP treatment and combination of them. No evidence of infection, suture dehiscence or other complications was observed in the rabbits. For correct and accurate histopathological evaluation of Achilles tendon in different groups, a numerical (quantitative) scoring suggested in material method was used. According to this scoring system, normal Achilles tendon score was number 16. In this study, the mean score for each group was obtained based on histopathology evaluation with H&E and MT stain calculation. Final histopathology scoring for each group was obtained based on gathering 8 different criteria scores. The results from each group were used for statistical analysis. Table 2 presents the mean value score in histopathological study. According to the table, the numerical difference between the control and treatment groups is obvious. One-way ANOVA test compared the groups separately for 4th and 8th weeks. No significant differences between control and other groups were seen at 4th week (P= 0/352) and 8th week (P = 0/381). The histopathology score was obtained from the results of H&E and MT staining. Histopathology scoring system evaluated the control tendon and the experimental groups with 8 criteria. Repaired tendon in histologic scoring of control group had significant difference with other groups at 4th week after operation. This finding is clearly seen in pictures stained with H&E in Figure 2. (A to D). Cell and collagen fiber alignment in last group (PRP + MSCs) was clearly better than other groups. Investigating all repaired rabbit tendons in MT stain revealed that vascularization decreased from control to PRP + MSCs. And also inflammatory events were not visible in last groups. Only little inflammation was detected in control group after 4 weeks in healing tendon. Microscopic investigation revealed that repaired tendon treated by PRP + MSCs can accelerate the healing process. Histologic investigation also showed that applying PRP had better repairing effects than using MSCs. At best, tendon repair requires a series of medical procedures such as physical modalities, growth factors, tissue engineering, mechanical stimulation, cell and gene therapy create optimum results. These treatments can improve the condition of the tendon tissue repair and increase the tensile strength. Also, it is important to choose the best type of medical treatment in order to return the tendon to normal activities and prevent its rupture and adhesion it to the adjacent tissues.20 One of these treatment methods is the application of platelet-rich plasma (PRP). PRP has a lot of growth factors which can accelerate repair process and decrease inflammation. The important growth factors which release from PRP are vascular endothelial growth factor, connective tissue growth factor, transitional growth factor beta 1, platelet-derived growth factor (PDGF), fibroblast growth factor, insulin-like growth factor-1(IGF-1), epidermal growth factor, platelet thromboplastin, serotonin, fibrinogen, calcium, and hydrolytic enzymes.21 The mechanism of PRP is not fully known. However, tumor growth factor beta (TGF-β), raised levels of PDGF, and IGF-1 might have a role in tendon recovery. PDGF triggers the creation of other growth factors in the intense phase of tendon injury. TGF-β prevents MMP activity during the inflammatory phase and has substantial effect on cell migration and proliferation. TGF-β starts proliferation of fibroblast and development of fibrosis. TGF-β lowers inflammatory process in recovery of tendon.22 IGF-1 increases cell migration and proliferation as well as collagen production and thus enhances healing.23 Hapa O. et al. have suggested that injecting PRP can lower the inflammation at the location of tendon injury, and lead to improve tendon strength after 2 weeks.24 These findings are in line with the results of this study. A number of researchers mentioned applying PRP treatment which has the capability to speed up tendon healing, increases quality of repair, and organizes fibroblasts and collagen bundles in a better way. Cell therapy is an additional treatment recently proposed for tendon repair which can improve healing by using bone marrow-derived mesenchymal cells. Bone marrow is a source of pluripotent stem cells including mesenchymal stem cells (MSCs). These cells are actually progenitor cells having the ability of producing mesenchymal tissue like fat, bone, connective tissues, cartilage, muscle, and tendon 25. Others reported that the using autologous bone marrow-derived mesenchymal stem cells in collagen gel can substantially enhance the structure of tendon after injury.26,27 The majority of studies insisted on using autogenic cells in order to avoid immunogenic complications. However, in the present study allogeneic cells were used because they have regulatory and commercial advantages. A number of these advantages include large cell bank with greatest quality control and simple use. Since using autologous mesenchymal stem cells could be challenging and costly as well as possible infection problems, cell therapy as modern treatment will be minimally used. 28-29 It has been mentioned that the knitted PLGA biodegradable scaffold loaded with allogeneic bone marrow stromal cells has the ability to create and repair gap defect in Achilles tendon and to successfully restore function and structure.8 This result is similar to our research findings. Additionally, Chen, L. et al. confirmed that combining tendon stem cells and PRP has synergistic effects on tendon healing under both loaded and unloaded conditions, and loaded conditions improve tendon healing.30 Our study revealed that using stem cell with PRP had best result in healing of Achilles tendon defect. According to the histologic scoring results of Achilles tendon treated with MSCs+PRP had the highest score and significant difference with other groups (control, PRP, MSCs). Microscopic investigation for this group showed that cell alignment and ECM organization were suitable and inflammation and vascularization were at the least limitation. In this study, different evaluations such as histopathology testing found the final score of all groups which was obtained at 8th week after operation improved compared to the score of 4th week for each group. This finding confirmed that duration of time is important in tendon healing. Also, this study showed that using PRP or cell therapy (MSCs) had little difference in Achilles tendon repair. It was mentioned that using MSCs as cell therapy in repaired tendon may have side effects such as ectopic bone. They showed that 28% of cases had ectopic bones. In this research no ectopic bone was diagnosed.31 The similar finding was reported by others.32 They reported that the healing time of injured tendon decreases by using combining PRP and LLLT(Low Level Laser Therapy). Young et al. highlighted that delivering mesenchymal stem cell-contracted, organized collagen implants to large tendon defects can substantially enhance the structure, and the function of the tendon after injury.26 For this reason, fibrin glue was used as scaffold in MSCs groups. In this study, Calcium gluconate (10%) was used for activation of PRP. Additionally, calcium can coagulate PRP which acts as scaffold in defect site of tendon. A histologic scoring system which was used in our research was based on C. Stoll et al with a little modification.3 MT as a special staining for connective tissue was used for staining the Achilles tendon. Tendon stained with MT improved histologic scoring specially in vascularization. This study indicated that using PRP or MSCs treatment alone and combination of them in injured tendon improved healing process and decreased time of repair. Use allogenic MSCs treatment caused no significant immunologic response 33. Reparative effect of PRP in tendon defect is better than use of allogenic MSCs treatment. Stoll C, John T, Conrad C, Lohan A, Hondke S, Ertel W, Kaps C, Endres M, Sittinger M, Ringe J, Schulze-Tanzil G. Healing parameters in a rabbit partial tendon defect following tenocyte/biomaterial implantation. Biomaterials, 2011; 32(21):4806-15. Lyras DN, Kazakos K, Verettas D, Polychronidis A, Tryfonidis M, Botaitis S, Agrogiannis G, Simopoulos C, Kokka A, Patsouris E. The influence of platelet-rich plasma on angiogenesis during the early phase of tendon healing. American Orthopaedic Foot and Ankle Society, 2009; (11):1101–1106. Jame R, Kesturu G, Balian G, Chhabra AB.Tendon: biology, biomechanics, repair, growthfactors and evolving treatment options The journal of hand surgery, 2008;33(1):102 –112. Barbosa D, de Souza RA, de Carvalho WR, Xavier M, de Carvalho PK, Cunha TC, Arisawa EÂ, Silveira L, Villaverde AB. Low-level laser therapy combined with platelet-rich plasma on the healing calcaneal tendon: a histological study in a rat model. . Lasers in Medical Science, 2013; 28(6):1489–1494. Young RG, Butler DL, Weber W, Caplan AI, Gordon SL. ,Fink DJ. Use of mesenchymal stem cells in a collagen matrix for Achilles tendon repair. Journal of Orthopaedic Research, 1998; 16(4):406-13. Awad HA, Butler DL, Boivin GP , Smith FN, Malaviya P, Huibregtse B, Caplan AI. Autologous mesenchymal stem cell-mediated repair of tendon. Tissue Engineering, 1999;5(3):267-77. Aggarwal S, Pittenger MF. Human mesenchymal stem cells modulate allogeneic immune cell responses. Blood, 105:2005;1815–1822.